Sidewalks are traveled slowly by foot, taking us from point A to point B. They aren’t measured in Miles per Hour(MPH) but in Cubic Feet. Most of the time we traverse them without much thought. They aren’t typically architectural masterpieces of design, but monotonous slabs of grey concrete. 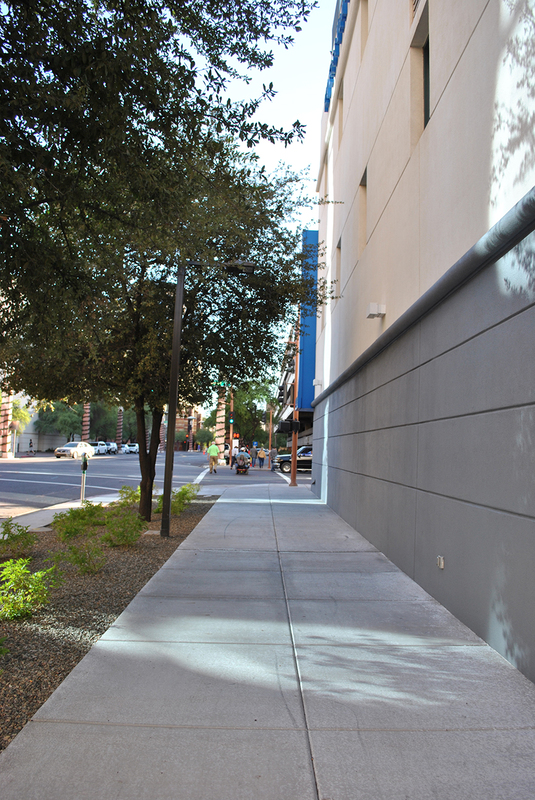 Sidewalks come in many colors, textures and finishes like that sweater you bought on Cyber Monday from American Eagle, but placing too much design may be trendy or outdated in years to come. A nicely designed sidewalk although can complement a building when designed properly. 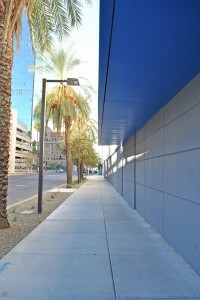 In the case of Digital Realty’s Data Center building in downtown Phoenix, the sidewalks are meant to take a back seat and not compete but complement with their new architectural façade. Digital Realty East Sidewalk after construction. In 2012, Digital Realty revitalized their facility at 120 East Van Buren Street. The building sits upon a downtown city block in Phoenix and is surrounded on all 4 sides by sidewalks. 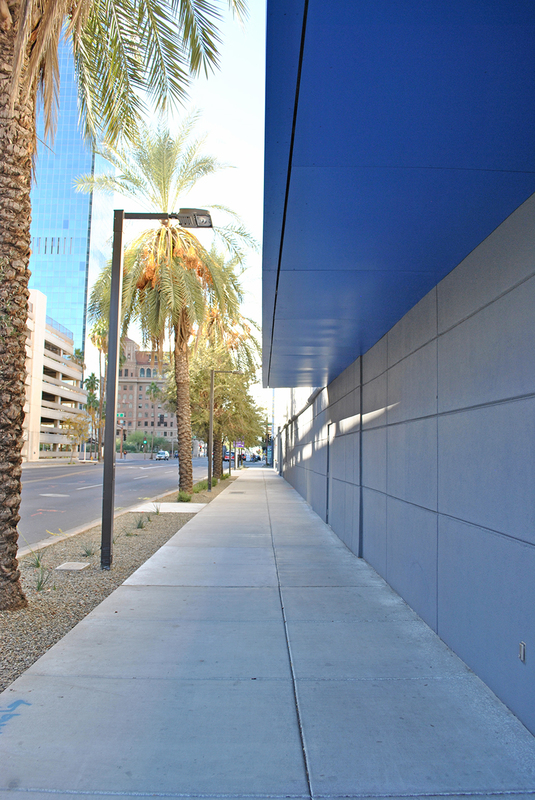 The building which originally housed The Arizona Republic Newspaper when constructed in the 1940’s, now houses Digital Realty’s Data Center. It’s sidewalks over the years had morphed into a variety of colors, textures and finishes. 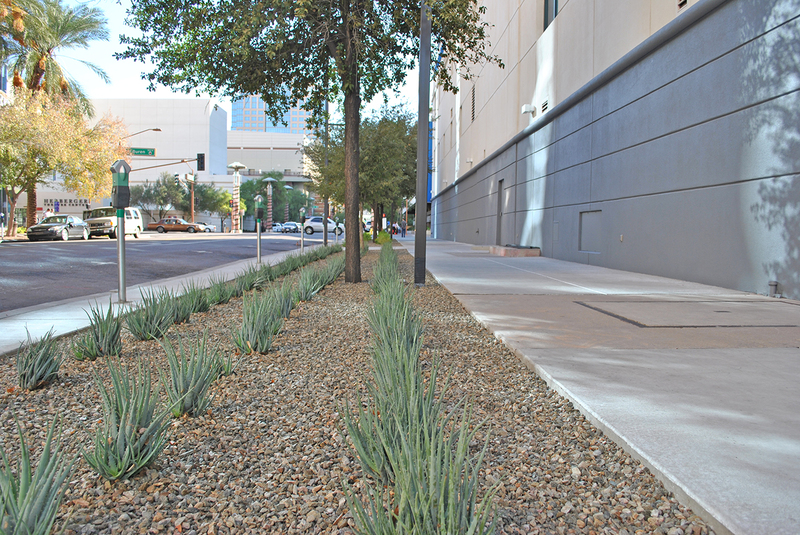 The sidewalks which were owned and maintained by the City of Phoenix, had bits of sandstone and pink concrete to reflect a south western motif. It was not complimentary to the forward looking façade and was haphazardly cut and replaced to allow for a variety of utilities that had been installed over the years. 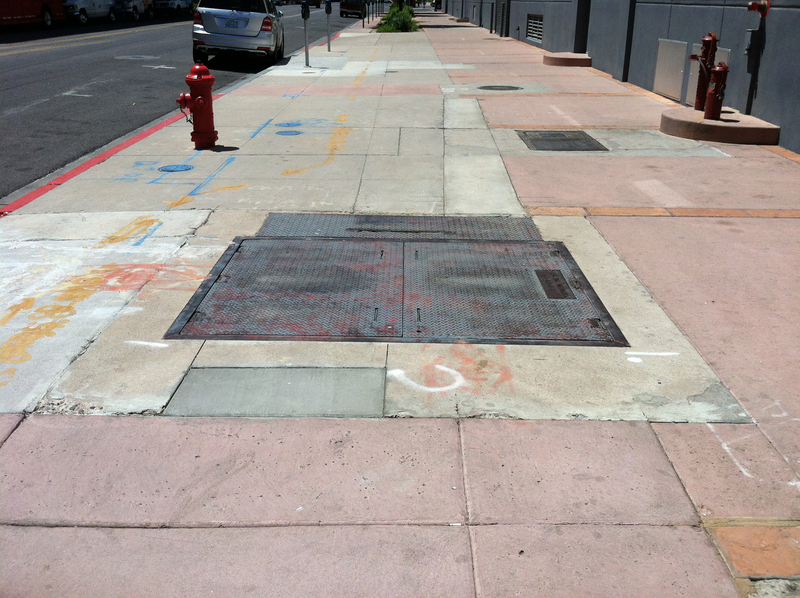 This made the sidewalks a bit of an eyesore. 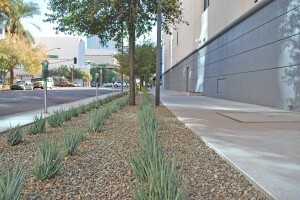 Landscape was not cohesive and City of Phoenix street lighting was inefficient. Archaic high pressure sodium lighting surrounded the site, not new energy efficient LED which are becoming the norm. Digital Realty South Sidewalk after construction. So in 2012, Serbin Studio and Digital Realty began the master plan design of new sidewalks around the facility. Digital’s brand is modern and sleek, representing the digital world of fast moving data. Their speed is more reflective of a Porsche Carrera GT driving 208 MPH than a Honda Accord in the slow lane. In 2013, Serbin Studio’s design was constructed for the new sidewalks, updated LED site lighting and landscape by DPR Construction. The sidewalks around Digital Realty are containing a fast and furious digital world, bringing you data not in MPH miles per hour or cubic feet, but in mbps megabits per second.